Trafalgar day parade is a special day for sea cadets in England. It is the day we remember the Royal Navy’s most famous victory. With the French under Napoleon about to invade it was vital the royal navy won the battle of Trafalgar, Lord Nelson, who sadly died after he was killed by a gun shot from a French sniper, led the British fleet to victory. On Sunday the 13th of October over 200 years after the battle on 21 October 1805 all North Yorkshires five cadet groups representing Harrogate, Scarborough, Filey, Hull and York paraded in Harrogate. The celebrations were led by the Harrogate Sea Cadets band. Most of the Harrogate Sea Cadets are in the band, we were very proud! The rest of the group marched behind the Marine Cadets from Scarborough from St Peters Church to the Council Offices. The parade was inspected by Commodore P Sutermeister in front of the petty officers (P.O.’S) and the chiefs. Over 120 Cadets united together to make a very good day. 54% of students find school boring, so why do we have a uniform if it’s proven that schools do better dressed down? Because we look smarter? Because it’s a status symbol? Or are we just dressed like this to show that the school maintains control over their troublesome students? Well we all hate those ugly blazers and uncomfortable tights (especially in the summer when they stick! )– Who is actually going to stand up for the uniforms? Does the school gain profit from our uniform? Do they want us to be miserable in our clothes? School uniforms are from a different era when young people were supposed to be seen not heard. So while school is a place where we can be ourselves, we can’t express our individuality? What are your views is school uniform good or bad for us? Posted on 16 July 2013. In September 2015 the new I level (Intermediate level) exams will be introduced. Their introduction will be the biggest change in school qualifications for over 30 years. And guess what, we, the current year 7, will be the first to sit the new exams. The reason is according to Ofqual, the exams regulator, is that a growing number of schools had lost confidence in GCSEs. View our interview with experienced senior teacher. I level interview from Atticus HGS on Vimeo. The aim of the new exams is to provide greater differentiation between the best students so they are going to b harder. The new changes, will apply first to qualifications in English, maths, physics, chemistry, biology, double science, history and geography. Other subjects will be ready to be taught from 2016. This will means we will sit a combination of I levels and GCSEs. Under the plans the highest grade will be an 8 and the lowest will be a 1. Coursework will no longer be part of the formal assessment, except in science, where 10% of your marks will be awarded for practical experiments. Under the new system, all end-of-course exams will be taken in the summer, except for English and maths papers that can also be sat in November. This is the end of modules. This will mean the end of lots of re-sit exams. Are these changes good? Are you happy to be the first year to sit these exams? Sergeant Steve Wood of Harrogate Sea Cadets came to speak at the Y7 assembly on 17th of June to tell us about life as a Sea Cadet. He is a volunteer who helps young people work towards joining the Navy and fulfil their dreams. However, you don’t need to want to join the Navy to join the Cadets. The Junior Cadets are aimed at young people aged below 12. When you become 13 you move up to the official Sea Cadets. It is a great hobby and can help you learn important life skills.. Sergeant Wood described the range of great activities available through Sea Cadets including mountain biking, sailing, wind surfing, climbing, paddle sports, and rowing. They do lots of camping, and you learn how to survive in the wild in “Camp Craft” training. You can even do courses in Liverpool, its on the sea. He explained that when you want to go to college or university or apply for a job, you can put all these things on your c.v.
We asked Sergeant Wood how many recruits go through the Harrogate branch and he said that a new course starts every 18 weeks. However, if you cant wait you can join at any time. If you are interested in joining you can find Sergeant Wood in the Hub where he works in the kitchen. You can also find out more details about the Harrogate branch of the Sea Cadets by clicking here. Posted on 18 June 2013. Kids rule Britans Got Talent don’t they? Now officials are complaining that there is too much stress involved for the children, and that many may find it intimidating by being watched by millions of strangers. A lot of young people are for this, but not us. Why, because many kids have incredible talents! if you watched this year’s show you will know what I mean! If a child has a talent and they want to share it with the country then they should be allowed to. This is one of the only ways that this is possible. 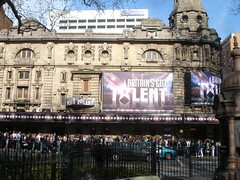 Yet if they ban kids from BGT then some children’s talents could go unappreciated and to waist. Silly people and bullies saying they’re rubbish risks ruining it for everyone. Jack Carroll a star in the making? Jack and Cormac – are they really going to make it at 13 and 14 years old. Is it the issue? Cant we and they simply enjoy their talent. Malaki Paul struggles with stage fright. At only nine years old should he have been on stage? Merida – really to be changed? Recently Disney released Brave an feature length animation about an adventurous girl who didn’t want to be the princess everyone expected. Set in Scotland a long time ago she refused to tie her wild hair up. She was a strong and powerful female role model. Now Disney has decided to change her and defeat the point of the entire film. In this new Merida, they have put a belt in place of her signature bow and arrows and she is wearing the exact dress that she tried so hard to get out of in the film. For her fans these changes have undermined the character or Merida and the purpose of the whole film. This has been another one of the changes that Disney made to film characters. These changes have raised a lot of controversy and thankfully Disney has now reversed the decision. Last week Rosie, Isla and Tom from the Harrogate Diving Club, competed in the G-Star competition at the John Charles Aquatics centre in Leeds. The event is held annually in Leeds and considered to be the toughest of the domestic club invite competitions. There were 15 British clubs competing as well as divers from Ireland, Sweden, Canada and South Africa. Sadly none of them won, but they tried there best. Follow this link if you want more information about the Harrogate Diving Club or are interested in joining them. Diving Competition at John Charles from Atticus HGS on Vimeo. In the interview I referred to Jack Wilson. He is in fact Jack Laugher and you can view his Look North interview below. You can see him diving here. The Harrogate Gang Show takes place every 2 years in April in the royal hall, it is a show put on by the members of the Harrogate Scout and Guide association. Children from as young as 5 years old to 18 years old took part in creating a singing, dancing and toe tapping spectacular! This year’s show was kicked off with a hearty version of ‘Be Part of our Gang’ a song specially written for gang shows. The Brownies and Cubs gave a very enthusiastic rendition of Gareth Malone’s choir, ‘Do Re Mi’ followed by ‘A Handful of Songs’, and ‘I’d Like to Teach The World to Sing’. The Rainbows and Beavers took a trip to the bottom of the sea and told some very fishy jokes before singing ‘Under the Sea’. It was all hoting when suddenly Apollo 11 landed. Out came a group of Guides and Scouts who had turned into spacemen. Our very own Neil Armstrong arrived singing ‘A Weekend On the Moon’ and was later joined by Buzz Aldrin. Other songs included ‘Catch a Falling Star’ ,‘Good Morning Star Shine’, ,‘When You Wish Upon a Star’ followed by ‘Fly Me To the Moon’ , ‘Moon River’ and rounded it off by spending ‘A Weekend On The Moon’. ‘Saturday Night at the Movies’ started the Oscar’s ceremony. The first award went to Titanic for the best film presented by ‘Helen Mirren’ who fortunately kept her remarks clean. We sang ‘New York, New York’ in tribute to Martin Scorsese, before Sharon Osborn gave the award for best song we then sang ‘Skyfall’. This was followed by an award presented by Kylie Minogue .for best cartoon which was given to Toy Story we sang ‘you’ve got a friend in me’. The final award was for best actress presented to ‘Anne Hathaway’ our final song was ‘do you hear the people sing’. Click to link to the Harrogate & District Gang Show gallery and see the rehearsals. Posted on 13 May 2013. Sometimes we forget to say thank you to the most important and influential peoples in our lives. This year year 7 entered the The Thank You Film Awards organised by Birmingham University. Each form had to produce at least one film. It was up to them to decide who and how to say thank you. Most Thank Yous were awarded to the people who have done something amazing but have not been recognised. The films were judged in a year 7 assembly with each form putting just one film through to the final. Our judges then would who decide which film and form would win. The best film was then sent as Harrogate Grammars entry into the competition. The winners will get a camera or go to or a day trip to one of the country’s best media companies. After a tough hour of tears and laughs, the winners for a great team effort was form 7 AMB. Well done 7AMB you deserve it. For a fantastic team effort and lots of very personal thank yous. Posted on 08 April 2013. The Perks of Being a Wallflower was released in February 2013. It stars Emma Watson, Logan Lerman and Ezra Miller and was immediately a box office sensation. Stephen Chbosky (the original writer) came up with a great plot. Charlie (Logan Lerman) is starting freshman year at high school and is the odd one out, the nerd, the geek. He feels isolated and alone. He misses his Aunt who suffered a life of abuse and died in a car accident when Charlie was young. His sister, Candice, is being abused by her boyfriend. Charlie becomes friends with Sam (Emma Watson) and her brother, Patrick (Ezra Miller). They allow him to explore his inner self, and come out of his shell. Whilst the plot isn’t unique the film is very enjoyable and engaging. I haven’t seen a Logan Lerman film before but I can definitely say this won’t be the last one I watch! His acting skills are exceptional. He really was very good. Ezra Miller was also impressive especially in the fight scene and Emma Watson deserves a special note as she was awesome as always. Soundtrack: I can’t stress how much I love the soundtrack! For someone with such of an old time music taste as me the soundtrack was audio heaven. The score was composed by Michael Brook and featured as the main song is ‘Heroes’ by ‘David Bowie’. For me that says it all. Other songs used included ‘Asleep’ by ‘The Smiths’. Not particularly a massive factor for this film. I mean with Avatar, the visual effects were one of the main parts that contributed to the wow factor; however with this movie it doesn’t really have that effect. Don’t get me wrong though, the visual quality is great. With a budget of $13 million, they can afford the best cameras out there! To conclude, this is a fabulous film that I would definitely recommend. As BLISS MAGAZINE said, it is possibly ‘The best film of the year’! Well, almost. I give it 4 stars out of 5. After a hugely successful (as always) residential at Myddelton Grange prior to the Easter holidays, the music students put on a concert for their parents and friends. The night started with the Main School Orchestra performing Handel’s ‘Royal Fireworks’ and Mendelsohn’s ‘Dance of The Clowns.’ Then the concert continued with a wide array of acts including the: Wind Band, Barbershop Singers, Solo Acts, Student Bands, Choir, Jazz Band and the String Orchestra. My evening picks were: the Barbershop Singers who were very funny as well as sounding very good, the String Orchestra’s rendition of Eleanor Rigby the classic Beatles hit, and the Wind Band’s compilation of John Williams’ compositions which even with a few giggles, was very pleasant to listen to! As per tradition, at the end of the night the teachers who gave up so much of their time to run the residential were gifted some sweet treats from Betty’s and everybody went home in high spirits. I hope you come next year! Breaking news Skye Donoghue wins National Taekwondo Championships. Skye (7RRF) competed in the nationals on the 26 March in Coventry and came first in her age group. Over 1000 people competed in the tournament. To win she beat two thirteen year and two twelve year old girls, even though she was actually ill that weekend! Her inspiration is Jade Jones who she wants to emulate by becoming Olympic champion. If you didn’t already know Jade Jones is a Welsh Taekwondo athlete who represented Team GB at the 2012 Summer Olympics. She won Britain’s first ever Taekwondo gold medal in the women’s 55kg category. Skye has been doing martial arts since the age of three including Kick Boxing MMA (Mixed martial arts), Points Karate and Judo. Originally she was inspired by the Power Rangers and still has all her old kit. The reason she decided to focus on Taekwondo was because it is in the Olympics and she wants to one day win a gold medal. To become champion she had to win 5 fights, including two semi-finals and the final. Next Skye is going to the World Championships in Coventry. What you may find hard to believe is that Skye only competed in her first Taekwondo event in September, but she was very prepared with a second degree black belt already on her record. She trains an hour and a half every night except Sunday and she trains at the GABT in Leeds. But if she wants to be an Olympic contender she has another 60,000 people to compete with. Best of luck Skye! !